Clean lines and architectural simplicity describe the exterior design for this 2 story office building located in the Borough of Haddonfield. The in-town location, efficient mechanical systems, and louvered sun control systems, all helped to achieve a Silver LEED rating for this environmentally responsive design. 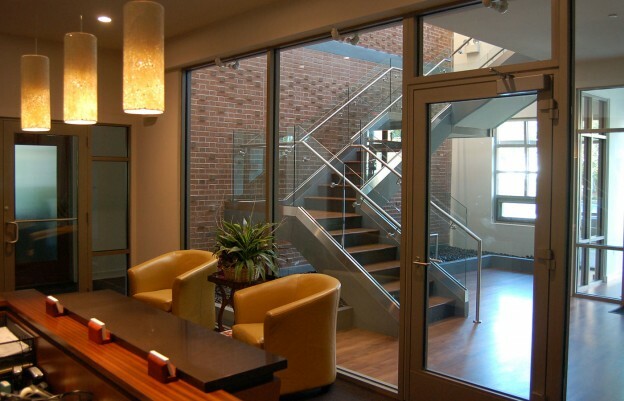 The interior office suites surround the primary focal point of the building, a centrally located front entrance lobby. This 2-story volume is generously illuminated by windows and overhead skylights, and has a full-height brick accent wall as a stimulating back-drop to the crystalline geometry of the main stair. Primary spaces within each office suite are strategically placed to best utilize bay windows, volume spaces, and interior views afforded by the building architecture. This entry was posted in Interior Design, Sustainable Design on October 22, 2014 by swolock.